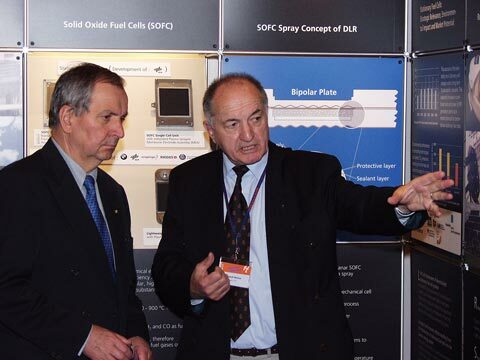 Arno A. Evers (right) welcomes Prof. Dr. Klaus Toepfer to the world’s largest Group Exhibit on Hydrogen + Fuel Cells. 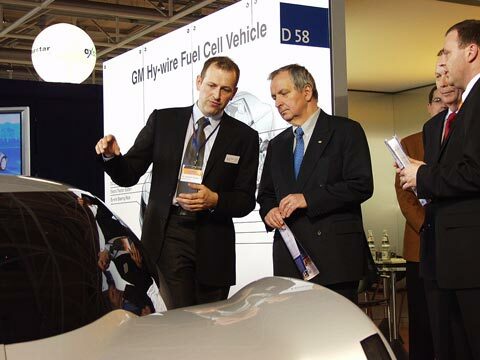 During his long visit tour of the Group Exhibit, Klaus Toepfer, Executive Director of the United Nations Environment Programme (UNEP), is especially interested in the development of mobile applications of Fuel Cells such as the car of the future, the GM Hy-wire, shown by Adam Opel AG, Rüsselsheim. 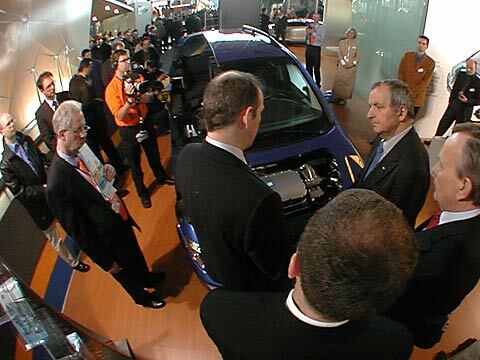 At the booth of DaimlerChrysler AG Fuel Cell Project he is looking at the F-Cell ­ the A-Class Application Concept. 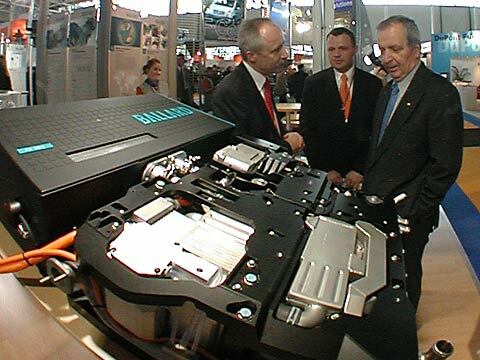 André Martin, Managing Director Europe and Transportation Programs (left) from Ballard Power Systems informs Prof. Dr. Toepfer (right) about the main engine components of the Xcellsis HY80 Fuel Cell Engine. 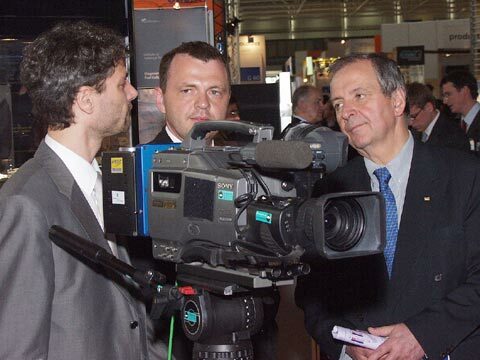 Prof. Dr. Toepfer has a very informative conversation with representatives of MTU CFC Solutions GmbH about the HotModule. 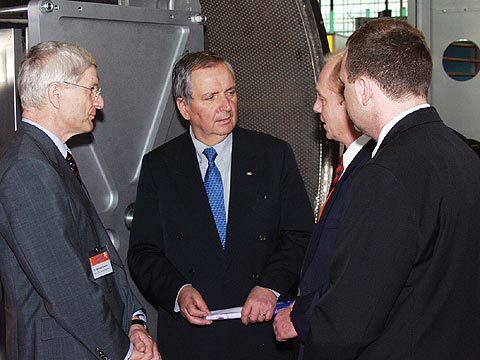 The Executive Director of the UNEP (left) is talking with Dr. Rudolf Henne (right) about the projects in decentralized energy supply for developing countries which are going to be realised with the Deutsches Zentrum für Luft- und Raumfahrt e.V. 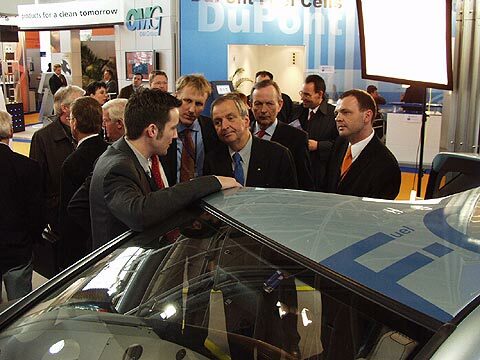 (DLR). 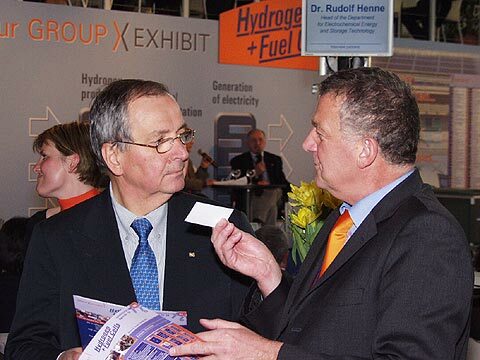 Ulf Groos, Marketing Manager at the Fraunhofer Institute for Solar Energy Systems informs Prof. Dr. Toepfer (right) about the advantages of the hydrogen powered HyCam.